On Saturday April 20th, to commemorate the opening of the hotel, a delightful surprise will await clients in the Courtyard Garden where over one hundred brightly colored balloons will be released and where a gigantic “anniversary” cake will be shared! In June, the Relais Plaza restaurant will take its guests to the most glamorous of historic cruises when its dining room will become a replica of the one on board of the famous French ocean liner ‘’Normandie’’. Throughout the year, all the hotel’s restaurants will celebrate the event by turning the spotlight on a dish specially created for the occasion. Guests in Alain Ducasse three Michelin stars restaurant could order a Hot Truffle and Guinea Fowl Pâté while a Melba with Seasonal Fruit designed by former pastry cook world champion Christophe Michalak could be savored in the Galeries des Gobelins and Poached Eggs Cardinal enjoyed at breakfast time. 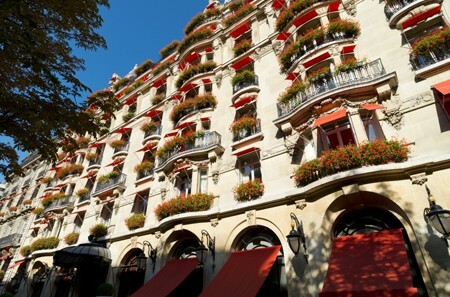 The Plaza Athénée is loyal to, and proud of, the values that have carried it through the decades without ever betraying its heritage and its love of innovation. This is why it wanted to give its clients something to remember by cooperating with just two of the very fine companies with which it shares a piece of history. No less than 100 trees purchased by the Plaza Athénée will be planted in the grounds of the Palace of Versailles in early spring 2013. The Plaza Athénée has also worked with the Théâtre des Champs-Elysées to offer its clients an opportunity to be among the privileged few at one of the performances of “The Rite of Spring” given to mark the centenary of the Theatre itself, on May 30th and 31st, June 6th and 7th and, lastly, June 25th and 26th.. Moreover, as a reminder of this partnership and the history that binds the hotel and the theatre, a Morris column decorated with posters of the time will be set up in the hotel’s Courtyard Garden. The hotel’s most loyal clients will receive a card made of precious metal produced in a very limited edition. They will then be the sole owners of this “pass of the century” and no more will ever be produced again. Finally, the 100th anniversary will also give the Plaza Athénée an opportunity to create a time capsule containing references to its history and heritage. A box in the hotel’s emblematic colors will contain items dating from 1913 and contemporary items that are representative of the hotel, so that they are passed down for posterity. What are these items? Only the Plaza Athénée’s most loyal “fans” will be allowed to submit ideas! The Plaza Athénée, Paris is part of the Dorchester portfolio which also includes The Dorchester, London; The Beverly Hills Hotel, Beverly Hills; Le Meurice, Paris; Hotel Principe di Savoia, Milan; Hotel Bel-Air, Los Angeles; Coworth Park, Ascot, UK; 45 Park Lane, London; and Le Richemond, Geneva.